ENGLEWOOD, Colo., February 21, 2018	(Newswire.com) - From a 150-foot platform, the young, fiery evangelist could see the crowds hadn’t filled the 1949 Los Angeles crusade tent to capacity. But for reasons unknown to Billy Graham, media mogul William Randolph Hearst issued a two-word directive to all his publications that made Youth For Christ’s first employee an instant celebrity. “Puff Graham” was the mandate Hearst issued and “the sudden front-page coverage" showered on Graham by Hearst newspapers... was quickly matched by other newspapers and news magazines [creating] literally a media circus descending on his rallies under a big tent,” John Dart reported in a 1997 Los Angeles Times article. The coverage enabled Graham to extend that Los Angeles crusade six more weeks, and to launch the Billy Graham Evangelistic Association and preach the Gospel to more people in live audiences than anyone else in history. Dr. Graham, who passed away today in Montreat, North Carolina, at age 99, helped birth Youth For Christ, an organization originally founded for ministry to youth and servicemen during World War II. Today Youth For Christ is one of the longest-recognized outreach organizations serving young people worldwide. 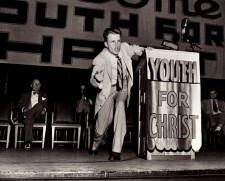 As Youth For Christ’s first field representative, Graham’s salary in 1944 was $75/week, plus expenses. In his first year with the organization, he traveled 200,000 miles speaking in 47 American states and establishing a pace and ambitious travel scope he would maintain for most of his life. 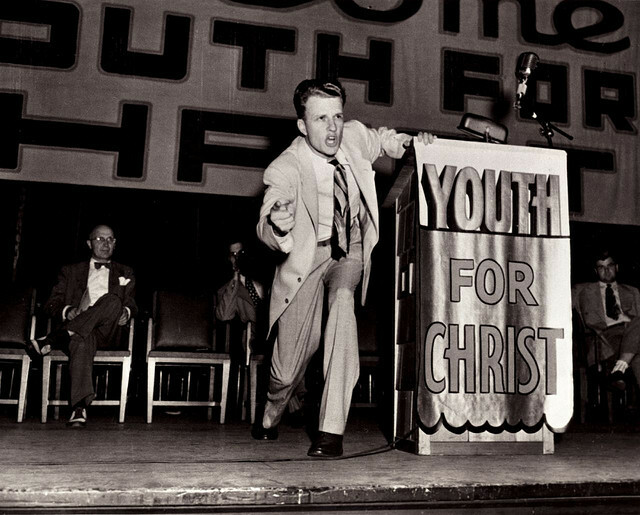 Graham made his first trip overseas in early 1946 and continued preaching throughout the United States and Europe in the immediate post-war era, emerging as a rising young evangelist. He went on to become Vice President of Youth For Christ International and to publish a book from his Youth For Christ experiences “Calling Youth to Christ” (1947). Youth For Christ is active with 23,000 staff and volunteers in 2,000 communities in all 50 states as well as more than 130 countries. Youth For Christ USA is committed to serving young people—especially those on the fringe—with sustainable youth and family outreach. A special legacy tribute webpage, with the ability to share personal stories connected to Dr. Graham’s legacy is available online at www.yfc.net/billygraham.